… is something Elizabeth Barrett Browning might have written, had she been an employee engagement consultant instead of a poet. There are dozens, if not hundreds, of definitions proposed or in use. Which is right? Which, indeed. How are we supposed to choose one? We might aim to pick the best, but the question of which is best depends entirely on what you mean by “best”. Perhaps that’s a sub-optimal way of going about things, and maybe we just should select a definition which is good enough, so that it is reasonably well fitting for our organisation and our circumstances (bearing in mind that both of these will change over time). Now, definitions of employee engagement are rather like oversized woolly jumpers – they fit where they touch. So we try them on, assessing whether each feels comfortable and is a reasonable enough fit (with perhaps room for a little expansion). Eventually, we select one whose size doesn’t offend. Based on our chosen definition, we then construct our engagement survey. Our definition will, presumably, translate into a list of factors to be measured, and these in turn will be transmogrifiable into a longer list of questions covering pretty much everything we can think of, because of course we wouldn’t want to leave a question out in case it mattered. Et voila – we can now go about measuring our employees’ engagement. Engagement is not really being well-measured. Typically, a survey may have 60-80 questions, often with several questions being asked about each factor. Results for each factor can be aggregated – but you can’t meaningfully compare these factor scores unless you’ve asked the same questions for each factor. (And have you? No – because the questions are specifically about the factors.) But without this comparison, you have no idea which factor should be the priority, and so you lack some of the fundamental information needed to construct an action plan. Let’s think about the woolly jumper problem again, but this time using more technology. Let’s envisage a body scanner connected via knitting pattern generator software to a knitting machine. Instead of trying on ready-made jumpers, we can have one that’s tailored precisely to our body shape. Put another way, this setup ensures that each part of the body has a corresponding piece of jumper next to it that fits perfectly. And so it can be with employee satisfaction. The first part of the definition – the list of things to be measured – is much easier than the second (deriving the formula). This list must be relevant to the employee, so should be a brief catalogue of factors that affect their working lives. Resist the temptation to ask loads of questions at this stage; you don’t know what’s important to employees, so you don’t yet know what you should be asking about. It’s important to ask employees the same questions about each factor, so that you can compare factor scores. Employees are therefore asked only two questions: “how important is this factor to you?”, so that you have a measure of their priorities, and “how satisfied are you with this factor?”, so that you know whether any action is necessary. Now factor comparisons are meaningful, and you can start asking focussed questions about those factors which both matter most and need improvement. Effectively, by asking employees to rate these factors for importance, you are crowd-sourcing the second part of the definition, namely a formula which is defined not only by your employees, but for each employee. It’s this difference that makes the jumper fit perfectly. 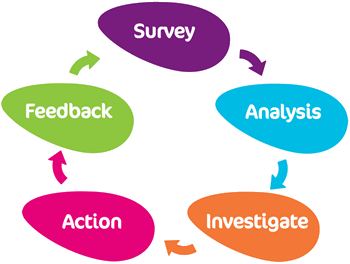 To learn more about how Thymometrics’ real-time employee engagement surveys can improve your internal communications, email info@thymometrics.com, call +1 646 760 9323 (US) or +44 (0) 1223 750 251 (Europe) or visit thymometrics.com.